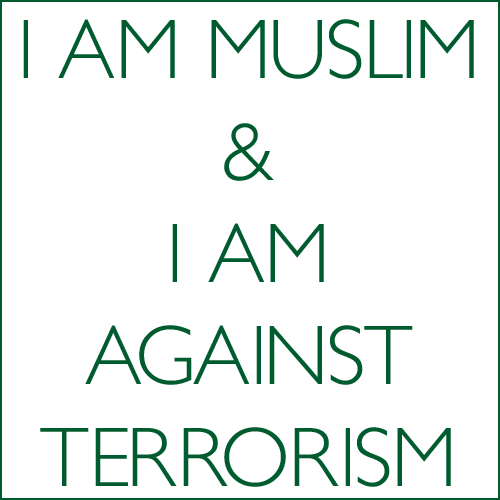 Muslims Against Terrorism - Where Are You? I feel like I am stating the obvious but it needs to be said. There is no place for 'extremism' and terrorism in Islam. Islam does not encourage violence especially against innocent people. It prohibits suicide be it for any reason. It is not allowed for Muslims to fund and contribute to terrorist activities. Except such as have Faith, and do righteous deeds, and (join together) in the mutual teaching of Truth, and of Patience and Constancy." In Islam we are taught that we have nothing to lose by encouraging people - both Muslims and non-Muslims - to be patient and constant in their good deeds. How can it be that Islam promotes violence against innocent people then? "The Believers, men and women, are protectors one of another: they enjoin what is just, and forbid what is evil: they observe regular prayers, practise regular charity, and obey Allah and His Messenger. On them will Allah pour His mercy: for Allah is Exalted in power, Wise." Muslims are to guide, not mislead, one another. A good Muslim would never encourage others to do sinful acts and would instead remind them about the rewards of carrying out good deeds and being kind. "Invite (all) to the Way of thy Lord with wisdom and beautiful preaching; and argue with them in ways that are best and most gracious: for thy Lord knoweth best, who have strayed from His Path, and who receive guidance. But if ye show patience, that is indeed the best (course) for those who are patient. For Allah is with those who restrain themselves, and those who do good." These verses sum it all. Yes, as Muslims we are supposed to invite non-Muslims to Islam with the best of intentions. We mustn't be forceful or get upset when people argue with us about our faith and most of all, we mustn't fight or be harsh with those who haven't caused us any harm. Only God knows what is best for everyone. The next time someone says “where are the Muslim voices?”, or “why don’t the Muslims speak up?” do something about it. Quote the Holy Qur'an and the sayings of the Prophet Muhammad (peace and blessings be upon him). Refer them to useful and credible resources. I am with you on this :) We are not what the media or the terrorists are showing they are. It's a hard time for us, especially because I live in Pakistan and the world thinks we aid terrorists which is wrong. We don't. At least not the people here support it. We have been targets to these So-called Muslims terrorists in all those bomb blasts in the name of God. it's ridiculous. Sara: Thank you for your support beautiful =) I hope you're doing okay over there. May Allah swt give us strength and patience to defend ourselves and our religion from horrible accusations and misconceptions. I adore you knowledge and understanding of the tafseer al quran. I really like the spirit of yours. Bring Islam to the top of the world. May Allah bless you always. YES! 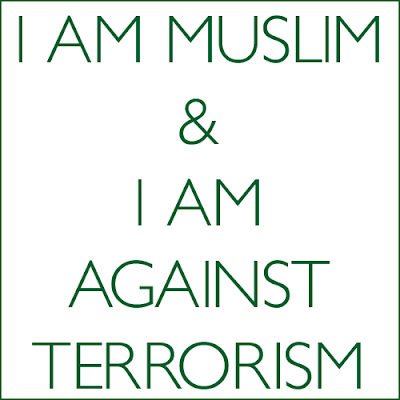 Islam IS against terrorism. I hate it that many associate islam with terrorism when our prophet did no such thing. You should consider being a lecturer! I am totally with you on this, Shahirah. Its ridiculous, tbh. Why dont they open their eyes and look into islam with a pure heart themselves? Shahirah, I applaud you for writing this post in response to my earlier comment. It speaks from the heart, and you are a role model for Muslims and non-Muslims alike in your stance against violence and terrorism. Well done! Hi Shahirah, i love reading ur blog. Yes true, in this era we Muslims have to play a bigger role in putting the right image of Islam. At least we should be able to step up and say that Terrorism is not Islam. Taking other innocent lives are not Islam. Islam is Islam. There is no such thing as Extreme Islam or Moderate Islam. We should not agree to branding of Islam in that manner, cause there is no such tolerence in Islam for murderers. And terrorism bombing, kidnapping and killing innocent lives are the act of murderers. How did you kill the cow? How did you kill the cow? I am at the meat store! Are you Muslim?? Say your Shahada!